With this in mind the 2 player local/online co-op mode feels a little underdone. The two modes are both survival challenges that see you and a pal trying to last as long as you can. In Survival Mode one of you uses the castles defences i.e. ballista, troops etc. the other is an unlocked hero. The two of you must fight against increasingly difficult waves of enemies. The second mode, Last Stand, is slightly different. Both of you play as heroes and you must defend your flag from encroaching enemies – this is a very hack ‘n’ slash affair. There is fun to be had in these modes, but it is short lived. Trying to compete to get the longest survival time only remains enjoyable for so long and it lacks the story the solo campaign provides. At least you both collect Gold from playing co-op and this can be used to unlock more elements in all game types. I also had other reservations with the co-op, especially in local split screen mode. The screen splits in a similar way to Resident Evil 5, two miniature TV screens appearing diagonally next to each other on your plasma. This means that the game is very small, especially in Survival mode when you often need to zoom in and out of the action to see the full field. I found it particularly hard to use the ballista effectively as I could not really pinpoint the enemies, even on a 32 inch TV. A dynamic split screen as seen in the LEGO games or a simple static screen may have worked better. It feels as if Zen Studios have tried their best to provide some sort of co-op experience, but concentrated on making the best single player game they could. CastleStorm is a great game; probably the most fun I have had with a Tower Defence title since PixelJunk Monsters. However, this is mostly due to the cracking campaign that varies the gameplay over time and challenges you to use the many game elements effectively. 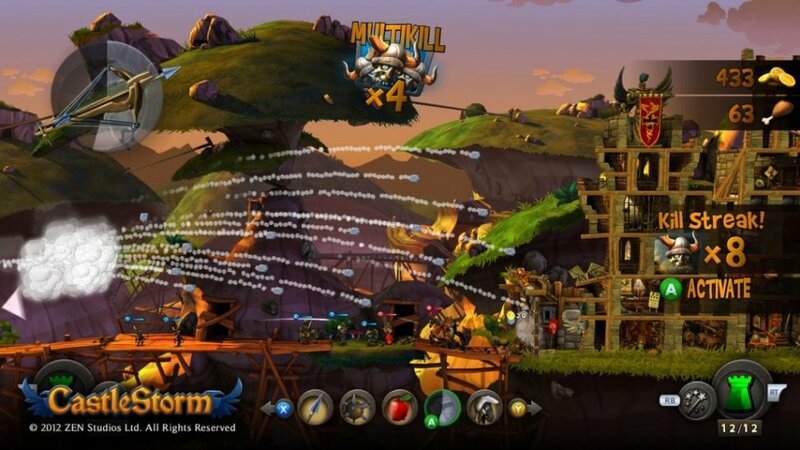 Zen Studios have a knack with physics and, although it may appear simple, they have created a dynamic castle attack game that has loads of different feeling projectiles. The 2 player co-op elements are really a small bonus addition, they provide some fun, but are not worth getting the game for alone. I would still recommend CastleStorm for the campaign, but must judge the co-op far more harshly on simple lack of depth. The Co-Op Experience: Two players team up in a survival mode or last stand mode. In survival one of you mans the ballista, whilst the other acts as a hero. Last stand mode sees both of you in acting the hero against endless waves of enemies.